I have used canvas bags on my bikes for close to twenty years. The cotton canvas material is strong, resists fraying and ripping far better than nylon, and stands up to the elements for a long time. Canvas ages well, too, lending your bike a classy, understated air of patina through years of use. The most popular canvas bags are transverse saddlebags, made by Carradice, Acorn, Berthoud and other companies. Once standard equipment on most British bikes (including those imported to the USA) from the 1920’s through the 1970’s, they are now enjoying a marked rennaissance as more people discover (or rediscover) their good looks and versatility. Transverse saddlebags come in several sizes and can hold a shocking amount of stuff! Carradice’s Camper Longflap model is so large that I’ve been able to squeeze ten Brooks saddles inside and still have room for a sweater on top. Smaller sizes, such as the Nelson and Pendle, are better suited for daily commuting and short errands. A variation of the transverse saddlebag is the smaller “paisley” model, made by various manufacturers (Citybikes sells the Velo Orange model, pictured). These are ideal for carrying a spare tube, patch kit and a few small tools along with your keys. The waxed cotton holds up nicely through our rainy Oregon winters, and the contrasting leather trim adds a nice touch. Canvas panniers, while not as popular as the newer rubberized fabric models, remain popular with cyclists who want a durable bag that also looks stylish. Carradice’s Super C touring panniers offer lots of carrying capacity for cross-country cyclotourists, while their smaller Kendall panniers make a nice set for commuting and errands. Most canvas bags today are made of waxed cotton. The wax adds waterproofing qualities to the fabric and lengthens the life of the bag, but these bags need to be re-proofed every so often to maintain their water repellency. Carradice and others offer a re-proofing wax that can be applied like a paste, rubbed into the fabric and then heated with a hair dryer to help the wax seep into the fibers. For daily use, I recommend that you re-proof your canvas bags every 2 to 4 years, depending on how hard you are on your things. In addition, if your canvas bag includes any leather fittings, you’ll want to treat these as well – but NOT with the cotton proofing paste! Instead, use Brooks Proofide or any other leather-specific restorative on leather trim and straps. 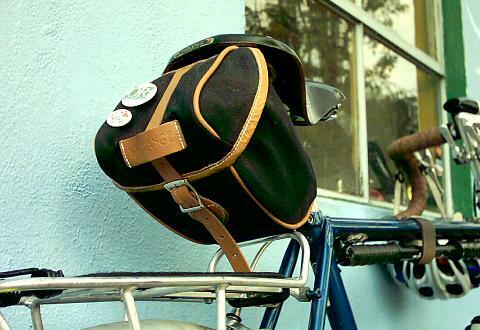 Because canvas bags are so stylish, they can unfortunately attract a certain sub-class of bike thief. For this reason it’s a good idea to take the bag inside with you when you lock up your bike. Various “hacks” can be created, modifying the bags to make it easy to remove them when going inside. A couple of commercially-made brackets (from Carradice and Nitto, respectively) now exist for this purpose as well. “they can unfortunately attract a certain sub-class of bike thief”. This is the reason I don’t like canvas bags. You know, I’m a victim of this worst practice. I was using a great looking canvas bag and people used to stare at my bike just because of it I think. But once I forgot to take it off from the bike and lost it. And now to avoid the hassle , I’m not using this bag anymore thought it’s of great use.